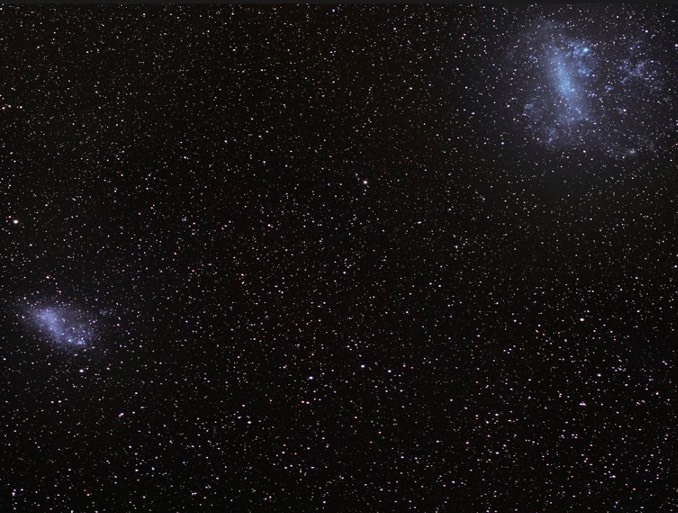 The Large and Small Magellanic Clouds, a pair of dwarf galaxies caught in the Milky Way’s gravitational grasp, contain enough gas to replenish about half of our galaxy’s store of star-building fuel. 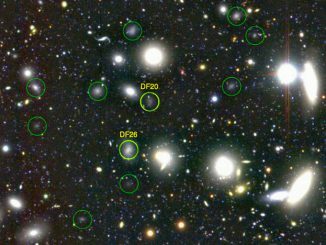 A new study shows mergers of such dwarf galaxies can spread that raw material over vast sweeps of space, making it easily captured by larger galaxies nearby. “You have this enormous reserve of star formation fuel sitting there ready to be stripped by another system,” said Mary Putnam, a Columbia University astronomer and co-author of a paper describing the analysis in the Monthly Notices of the Royal Astronomical Society. A research team led by then-Columbia graduate student Sarah Pearson studied a remote pair of dwarf galaxies – NGC 4490 and NGC 4485 – some 23 million light years away. 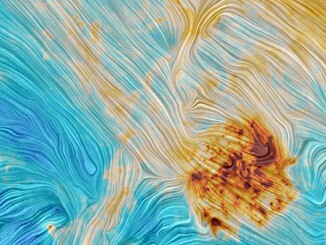 They are similar to the Magellanic clouds but in an isolated location, beyond gravitational interactions with the Milky Way. 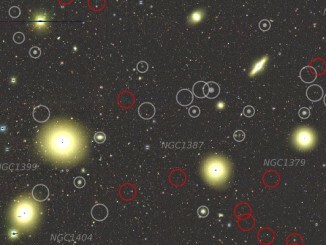 In a blog post describing the study, Pearson, now a fellow at the Flatiron Institute’s Centre for Computational Astrophysics, George Privon of the University of Florida and Gurtina Besia at the University of Arizona describe computer simulations that match past interactions between NGC 4490 and its smaller companion. The smaller galaxy “plowed through the disk of the larger galaxy less than 300 million years ago,” the authors write. “After 5 billion years, 10 percent of the gas envelope still resides more than 260,000 light years from the merged remnant, suggesting it takes a very long time before all the gas falls back to the merged remnant, ” says Pearson. The study suggests this process has helped the Milky Way strip gas away from the Small Magellanic Cloud and could be a common method of gas transfer across the universe.